They may look big and tough, but Survivor Australia's Mat Rogers and Commando Steve Willis are a couple of softies...and we love it! As part of the Champions team, both have shown their strength on the playing field and in the army, respectively, but viewers have seen a softer side to these two. So when family men Mat and Steve get together, it's always a pleasure to watch as they get their bromance on. READ MORE: Here's how you can follow your favourite Australian Survivor contestants on Instagram. The two have shown their loyal, compassionate side from the start when they refused to vote for double amputee and tribe mate, Damien Thomlinson when poker player Jackie Glazier put his name forward. "He's a good guy, he's a hero. He's the only hero here," Mat said. "Yes he's got two prosthetics, but you've got to remember the reason why he's got two prosthetics. The poor bloke was blown up in Afghanistan. He's tougher than all of us," Steve added. READ MORE: Who is Damien Thomlinson? Needless to say, they weren't happy when he was voted out. After a reward challenge when the Champions team won gifts from home, Mat and Steve showed that under all the tats and muscles, they're just two guys missing their families. And coincidentally, both men are dads of four. "My family is the best team I've ever been a part of and I just miss being away from it so much," Mat said after receiving a photo of his loved ones. "Family, to me, is everything. My kids really mean the world to me. I think that's something that I've searched for, not that I've needed to search for my whole life, is love and acceptance." 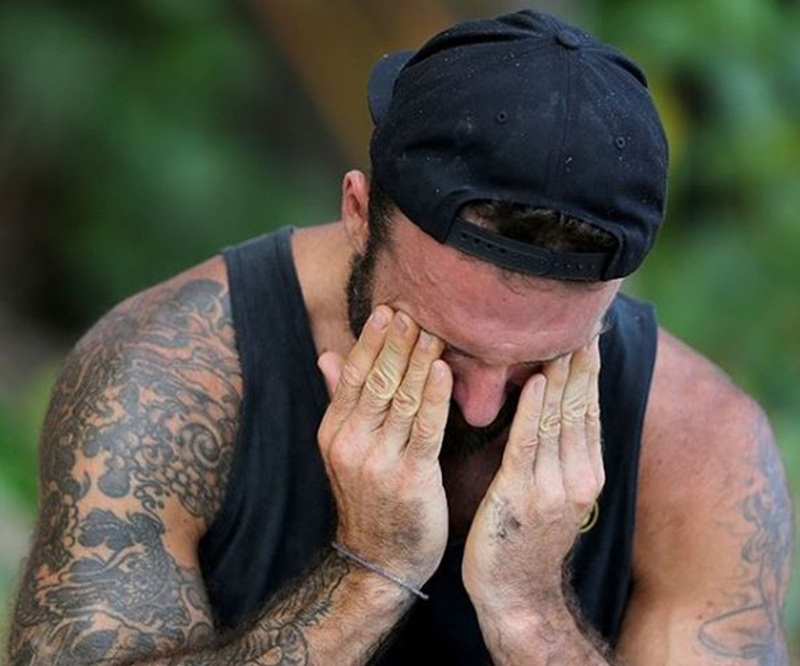 In an Instagram post after the episode aired, Mat captioned a photo of an emotional Steve opening his presents from home saying, "This guy, @commandosteve one of the best.. Brother from another mother.. #rocksolid." Whether they're performing challenges and encouraging both their team mates and the Contenders, or even just relaxing back at camp, Mat and Steve have shown they are very similar. In a chat with NW, Steve revealed that he has made some lifelong friends, and we're assuming rugby legend Mr Rogers is amongst them. "There were a few of us that kind of gave our word to each other early on and we stuck by that word and it's amazing." And their tribe mates only have good things to say as well. Speaking about her buddy Mat, Moana told TV WEEK, "He's a beautiful man and what an athlete!" "And Commando Steve, he was the monk of the tribe. He would be a yogi, and he would give out inspirational quotes, he was just the coolest dude." WATCH BELOW: Commando Steve shaves Mat Rogers...Survivor style! SurvivorWho is Mat Rogers and why do we suddenly care?